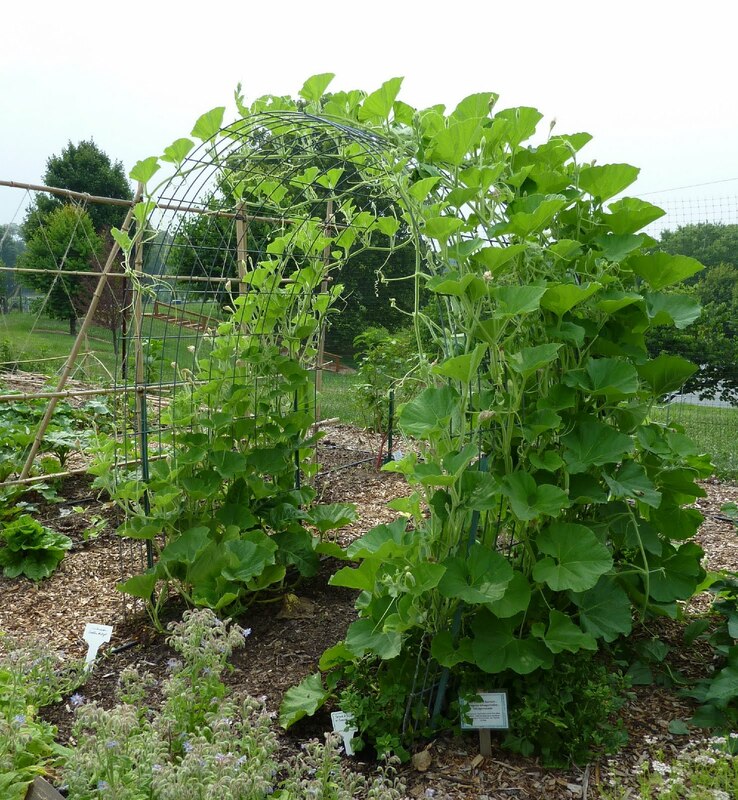 The trellises are filling up fast in the demo garden, and this cattle panel arch is one of the most impressive. 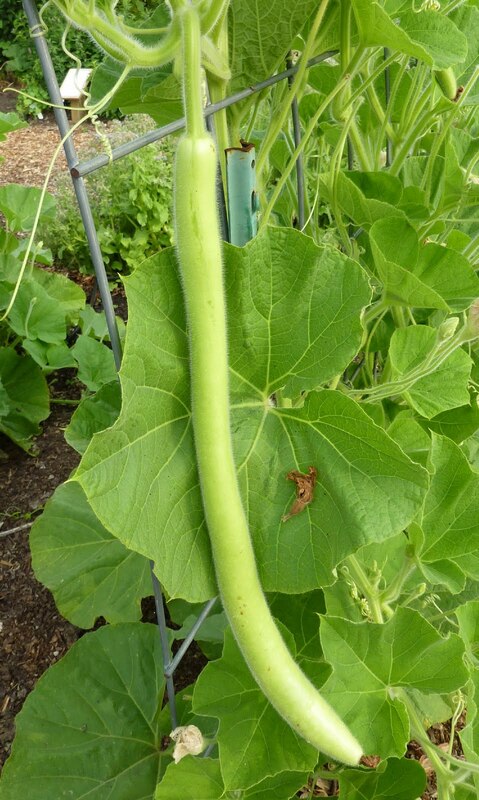 On it we’re growing cucuzzi gourds (Lagenaria siceraria) which I just had to have after admiring them at Monticello last year. They’re pretty big, but very edible. This one is well over a foot long, and will keep growing till it’s three feet or more (by which time it may not be so edible). I harvested this slightly larger but less potentially decorative fruit today (lying on the ground, it wouldn’t get long and straight) and prepared half of it for dinner, sauteed in olive oil with onions, garlic and medium-hot peppers. It tastes a lot like zucchini (the Cucurbita pepo sort) though I’d call it a little blander with a tougher skin (should be harvested younger). This is how it looks, cut up. The other thing that really impresses me about cucuzzi is the strength of the tendrils. They are massive! This can be a problem if you are not around to frequently persuade the vines that they want to climb the structure you’ve offered and not some other adjacent structure or plant. 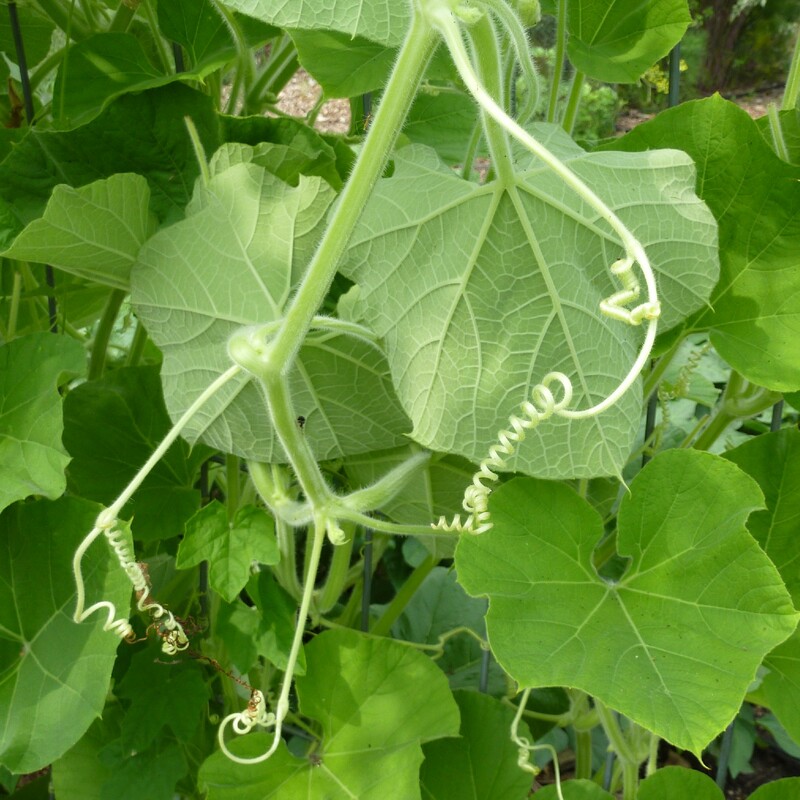 I’ve had to snap quite a few tendrils already – no problem for the cucuzzi, though. I seem to have used the word “impressive” and its forms a lot in this post! Well, that’s what the cucuzzi gourd is. 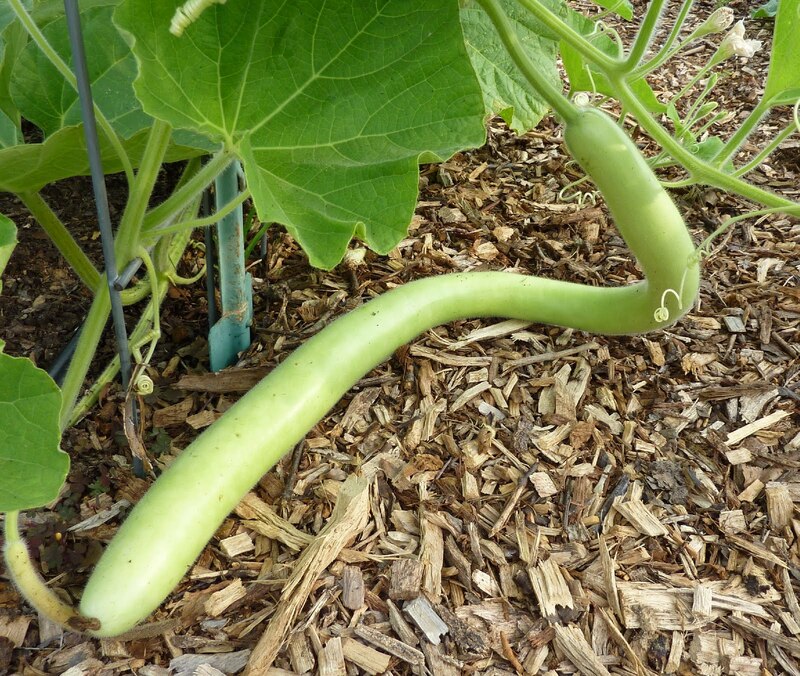 It reminds me of the zucchetta tromboncino (or rampicante) squash we usually grow but are skipping this year (that one would be on the Americas side of the garden if we were growing it), but it is a little more agreeable when it comes to climbing. It’s fun – if you have room, try it! skin of the cucuzzi needs to to pealed. Growing this in my yard. Seeds were handed down from my Grandparents. Oh man, now I'm confused….. I had thought Cucuzzi and Trombocini were the same veggie. Are they both immune to the Squash vine borer? That's my main problem. What are other similarities or differences? Both should be pretty resistant to squash vine borer. The main difference otherwise (aside from one being a squash and the other a gourd) is the blander taste of the cucuzzi and the tougher skin, especially as it gets larger. Erica, thank you so much for your reply! It sounds like Tromboncini would be the better choice then. Which direction to orientate the cattle panel trellis is best? East to west, or north to south? Thanks. If you're using an arch like in the photo, east-west would work better so as to give equal access to sun. Tromboncino will grow aggressively toward the sun, so don't plant it on the north side of a trellis or it will refuse to climb it – I found that out the hard way! Growing cucuzzi for first time, 4 flowers bloomed so far, but two of the flowers broke off their stem. Is this supposed to happen, and where does the vegetable come from? 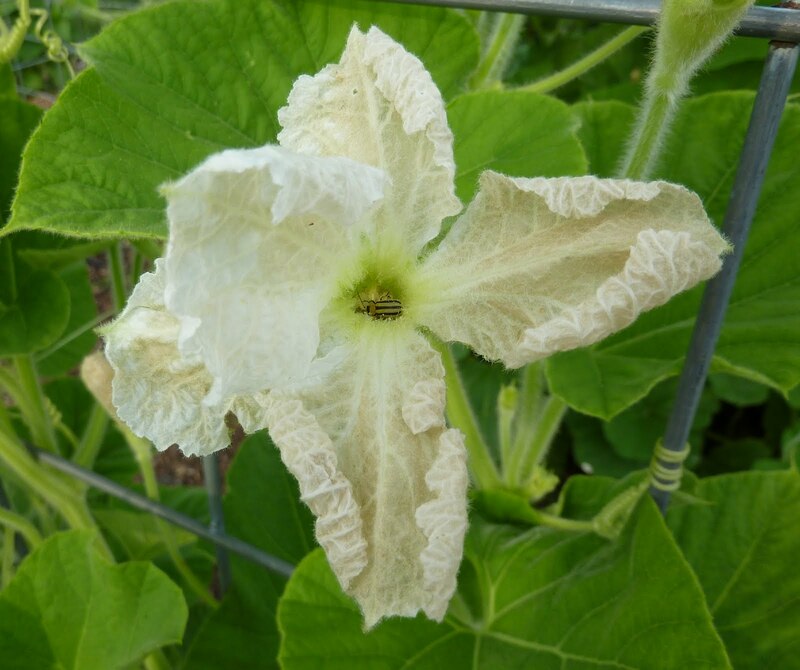 Does it grow like zucchini with the flower connected, or more like tomato where the flower falls off first? Or does the vegetable grow separate from flower? 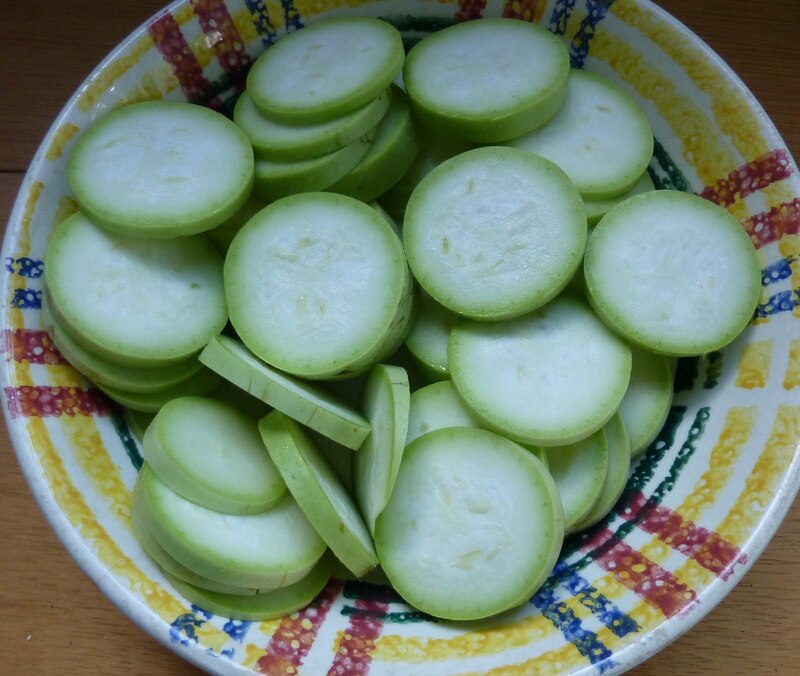 If I recall correctly, it's similar to zucchini and all other vegetables in the family, with the flower connected. I wouldn't worry too much about losing the early flowers – there will be more.